You’re adept at marketing your products. But how good are you at marketing yourself? In this article, we provide a suggested customer lifecycle for your career. Read on for tips from 12 HR professionals and marketing peers. 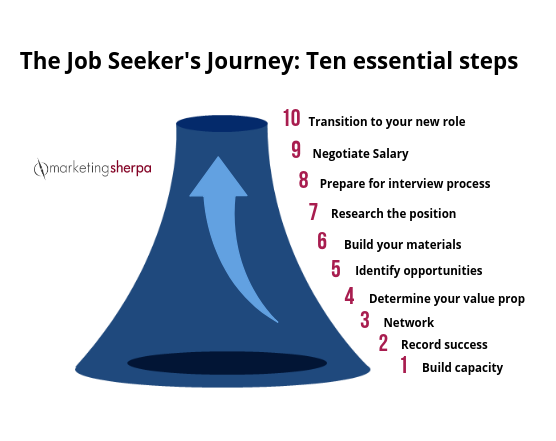 If you’re not looking now, if you’re actively looking or if you just accepted a job, you’ll find yourself on one of these nine steps of the job seeker’s journey. Whether you currently have a job, are unemployed and looking, or are just graduating college — you, Marketer, are a commodity. The national unemployment rate for college grads is at just 2.1% (according to the Bureau of Labor and Statistics), and marketing hiring is expected to increase by 5.1% this year on top of a 7.3% rise last year (according to The CMO Survey, which also notes, “Companies expect to hire full-time marketing employees over contractors,” while cautioning that the uptick in hiring is slowing). As marketers, we are adept at marketing for our brands. But as I can attest after interviewing hundreds of marketers (both in job interviews and case study interviews), sometimes we forget that our career or job search is also a marketing campaign. “A job search is a sales process,” Rafe Gomez, co-owner, VC Inc. Marketing, told me. Every ultimate conversion (including you getting a job) has a funnel — a series of steps that need to be taken along a path until a final decision is made. Here is a look at that funnel for the job search process. If you currently have a job and aren’t looking for a new one yet, you might be at the beginning. If you’ve been on the job hunt for a while, you might be near the end. Wherever you are, this is a handy guide to keep with you throughout your career and make sure you’re constantly making the right moves to ensure your (self) marketing campaign is a success. The first thing you need is a valuable product to sell. If you’re a recent college graduate, you’ve made yourself more valuable by getting your degree and internships. If you’re into your career, your work experience has made you more valuable. And you can always further build capacity by taking professional marketing certification courses. Every value proposition, including a personal value proposition, needs evidentials. It’s easiest to keep track of them as you go instead of trying to harken back to what happened several years earlier. As the old saying goes, “It’s not what you know, it’s who you know.” A strong network can help you every step of the way through the job search process. If you’re looking to move into a new industry, networking can lay the groundwork for a successful transition. “Start building up a network in this sector or industry. Ask for introductions to related people,” advises Christine S., career and business coach, Christine Coaching. Having an optimized LinkedIn profile is important before you ever start looking because it helps you catalog your network (what businesspeople used to call a “Rolodex”). Once you start, you will likely want to make some changes to your profile. “One of the first things you should do to indicate that you are interested in learning about new opportunities is to add ‘and (the field in which you are looking for work) professional’ to your LinkedIn profiles. I did an informal study a while back of recruiters and the keywords they use. More than half of them told me ‘and (fill in the blank) professionals.’ Making yourself easy to find is more than half the battle,” said Phil La Duke, Global Principle Consultant and Author. When you begin a job search, you’ll want to find job openings, of course. And your instinct might be to dive right in. But first, it could be worthwhile to take a step back and determine your personal value proposition. Even in a strong job market, hiring managers have many options to choose from. Why should they choose you? your current organization or a future organization that you'd aspire to work for. Having this clearly outlined will help you in future steps. Just like a company doesn’t have a strong value proposition for every customer in the world, you likely don’t have a strong value prop for every possible employer. But to your well-defined ideal customer, you do. So going through this process could also help you craft an ideal customer profile. This exercise helps you determine if your current company and/or any other internal opportunities are the right fit for you, as well as which outside job opportunities are worth pursuing. Applying for jobs is a time-intensive process. You don’t want to waste time on companies you can’t truly serve, won’t excel at and won’t find personally fulfilling. It’s a combination of self-exploration and market exploration. Ask yourself questions like, “What are the market needs? What kinds of jobs are there? Where I can use my skills?” advises Lokesh M, marketing executive, RezRunner. In addition to what you can do well, consider what you enjoy. What work makes your heart sing? “Start with assessing one’s skills and what type of work one finds rewarding,” suggests Nate Masterson, CEO, Maple Holistics. This stage sometimes comes with a trigger — you lose your job. In this case, it’s important to first land on your feet. File for unemployment insurance, secure health insurance, understand and perhaps negotiate a severance package, and the other steps you need to keep going. “For some, the reason to start searching for a new job may be due to dissatisfaction with a current position. For others, it may be due to moving to a new area of the country, looking for career advancement opportunities or a total career change. The first step in the job search cycle must always be a desire to change one's current situation,” said Kathryn Mancewicz, personal finance blogger, Money and Mountains. Your network is a great place to start your job search. “Conduct informational interviews. Ask for a 15 to 20-minute coffee or phone call. Ask questions about the culture, best time to apply, typical career path, how did that individual get into the company. Make sure you are very clear on what job titles you are looking for. But do not directly ask for a job. Be respectful, courteous and make sure to always follow-up with a thank you email,” advises Christina D. Warner, healthcare marketer at a Fortune 500 company and columnist for Thrive Global. Applying for jobs can be a very time-consuming step, so identifying the right opportunities is crucial to getting the best return on your time investment. Just like a brand shouldn’t try to sell to every possible person in the world, a job seeker should focus time and resources on the best and most relevant opportunities. Now that you’ve found the right opportunities, target your general resume toward those types of positions. “Your resume should position you for the job you WANT, not the one you have. That means, understanding what the relevant skill sets are, experience, training and knowledge that will be important to hiring managers who are assessing candidates at your level. Look to relevant job descriptions to see what kind of language they’re using, and make sure that’s echoed throughout your resume,” advised Dana Leavy-Detrick, Managing Director, Brooklyn Resume Studio. A resume really needs to serve two purposes — one for robots and one for people. For robots, you need to understand what the resume should contain to get through the applicant tracking system. For the human, it is a piece of marketing material. To that end, consider what resulting conclusions you want people who read your resume to walk away with. Don’t just overwhelm them with information. Guide them to a logical conclusion based on the most compelling evidentials you have to sell yourself. This part of the process is quite similar to other marketing challenges you’ve faced. For example, SEO and social media platforms require an understanding of the machine (algorithm) and human (the customer) you want to serve with your content, landing pages, posts, etc., to be successful. This is, essentially, personalizing your marketing campaign. Now that you know about the company and hiring manager, you need to craft a personalized solution based on their needs and wants. You can leverage the value you created and recorded before you were even looking for a job to help craft that custom solution. Personalize your general resume for the specific position and write a compelling cover letter. This is where the marketing/sales handoff happens, so to speak. You’ve got the lead and booked a sales call (interview), now you must put on your sales hat and use this one-to-one (or one-to-few) medium to learn more about the unique challenges of this customer, determine if you’re a right fit to serve them, and if so, outline how you can serve them using your previous experience and education as proof points. The research you’ve already done will help power a successful interview. “One essential thing job seekers tend to skip is company research in the early interview stages. If you're able to go into an interview with knowledge about the company and how your expertise could add value, as well as with the knowledge to ask really insightful questions, you will be miles ahead of 99% of the other candidates who haven't even pulled up the company webpage before attending the interview,” said Stacy Caprio, Founder, Growth Marketing. Just as the sales process doesn’t end with the sale, the interview process doesn’t end with the interview. Make sure to continue the communication with the potential employer. “Be sure to send a follow-up, or send a thank you letter within 24 hours of your interview as a professional courtesy. This is also a great opportunity to reaffirm your interest in the role and recap key parts of your conversation that highlight your qualifications for the job such as ‘Thank you for your time on Thursday. I enjoyed speaking with the team, and after learning more about your code base, I’m confident that my programming knowledge and troubleshooting skills can bring value to the role,’” Leavy-Detrick said. “Once you’ve received the job offer, you may have the opportunity to negotiate things such as the base salary, bonus structure, total compensation package, paid time off or flexible work arrangements,” Leavy-Detrick said. You can conduct that salary and compensation negotiation by email, in person or over the phone. Whatever you do, it can help to get the specifics in some form of writing before you start — to make sure there is no misunderstanding about what was agreed to. If you have multiple offers or have a current job, compare not only the salary dollar amount but also the total compensation. For example, how much is the health insurance premium and how good is the coverage? Does one position offer more paid time off than another? Will you incur more commuting costs (paying more for gas, renting a parking space, etc.) or wardrobe costs (formal culture versus creative culture). “Often, we see candidates rush to accept without making simple requests for changes in an offer. Maybe it’s as simple as having some flexible time or working from home one day a week. Waiting until you have accepted or start the position turns a simple request (when YOU have hand) to an iffy, less likely to be agreed upon situation,” said Bridgette Klein, marketing manager, Willory. After hearing Klein’s advice, I can’t help but make a “Seinfeld” analogy. As George Costanza said, “I got so much hand, I’m coming out of my gloves.” But learn from George’s mistake as well. Just as you gain hand, you can lose it as well. Sometimes hubris leads to a fall, so don’t overdo it. Salary and compensation negotiations are different than other negotiations because your ultimate goal is to work with these people in a collegial atmosphere. So make sure you are negotiating with a win-win mindset. The job search doesn’t end once you’ve accepted an offer. For one, make sure you treat your current employer well. In addition to the fact that you want to do right by your current company, many industries are small worlds. If you treat a company poorly, word is likely to get around and hurt your reputation. As you’re smoothly transitioning out of your old role, make sure you smoothly transition into your new one. First impressions are hard to change. I’ve seen new employees rub their peers the wrong way for everything from challenging the way work is done to requesting a covered parking space. While you may be excited about all the new things you can do at the new job, start humbly. Ask more than tell. Understand not only the current work processes and workflow, but how they were arrived at. Who knows? Your new co-workers may have already tried some of your novel, exciting ideas — and learned they didn’t work.